There is a lot more you can do with a Pizza box than you can think. 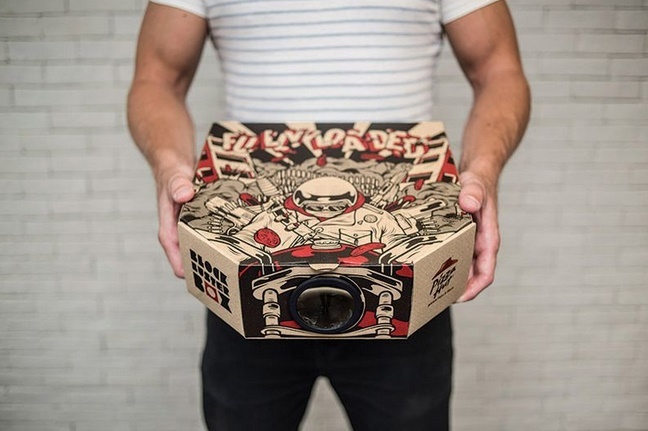 This is firmly believed by Pizza Hut and hence they have designed their pizza boxes in a special way that it can be used as a movie projector. No, not everywhere but in Hong Kong. This undeniably a good way to reuse things. The idea of using Pizza Hut boxes as movie prpojectors has been provided by advertising stunt Ogilvy from Hong Kong. Ogilvy uses the Pizza Hut boxes with a perforated, pop-out hole in the side of the box. The lens like thing you wee in the picture is actually a part of the Pizza Table that protects the pizza from damage. The Pizza table comes with the lens, from which you can detach the plastic lens. This lens is made in such a way that it can be fitted in to the hole and work like lens for the projector. Now you can use the table as a stand to support your smartphone. This contraption then throws up your phone’s display onto any nearby wall. Even though you’ll not get a movie hall effect and probably you’d not want to stick all the cheese and sauce to your smartphone, still this approach is appreciable.